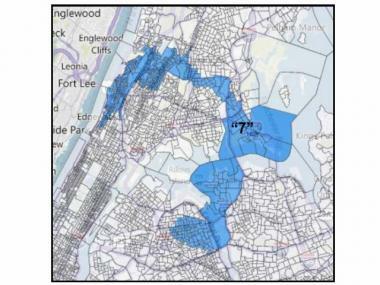 HARLEM — A group pushing for a Dominican Congressional district that would encompass parts of Washington Heights, Inwood, the Bronx and Queens filed a legal challenge Wednesday to newly proposed congressional lines. Under the new congressional lines released Tuesday by a federal judge, the former historically black 15th congressional district, now represented by Rep. Charles Rangel, would remain largely the same and include more of the Southern Bronx. The new district would be 55 percent Hispanic. But the plan doesn't do enough to link people of "like interests" said Maria Teresa Feliciano, president of the Dominican American National Roundtable. "The maps proposed by the court would totally ignore the fundamentals of redistricting which is keeping communities of interest together to elect a candiate of their choice," Feliciano said. The proposal supported by the Dominican American National Roundtable would have taken a portion of Rangel's district in Upper Manhattan and would stretch across Washington Heights, through the eastern part of Inwood and then into sections of the northwest Bronx, including Kingsbridge and Morris Park, and over into Jackson Heights and Corona in Queens. The Hispanic population in those areas has increased 35 percent over the past decade, Feliciano said. Just adding Hispanics to what would be the new 13th Congressional district does not address the group's concerns. "New York is losing two seats due to reductions in population, but the Latino population has greatly increased in size and the new maps must reflect the new demographics," Feliciano said. The federal judge released the proposed map, required every 10 years, after legislators were unable to agree on new lines. The Dominican American National Roundtable unveiled their objections at a Brooklyn press conference that was devoid of politicians, Feliciano said. There has been some speculation that Latino and African-American politicians are seeking to avoid the appearance of being at war with one another over the creation of the new district. Rangel has been adamant that the base for the seat remain in Harlem. Feliciano said the coalition includes politicians from Harlem and Washington Heights and she suggested not reading too much into their absence. "This is a cry for representation from the community," she said.